A West Hull charity will send its 2,000th bike to Africa this month. 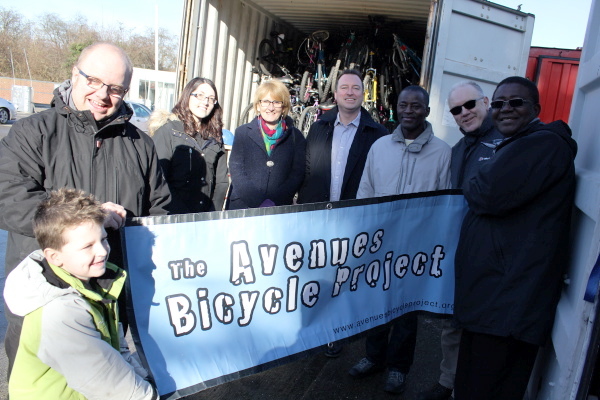 The Avenues Bicycle Project has been sending bikes to the continent since 2012. But now, it will celebrate a major milestone when it makes its next shipment of 380 bikes to Sierra Leone on Monday, February 22. When the charity started, bikes were stored in sheds and garages across the Avenues. Now it has a secure storage point at Sewell on the go in Chanterlands Avenue. The site gives them increased storage and the peace of mind of 24 hours a day CCTV and lighting. Chris Jarrell, founder of the charity, said sending the next shipment was a huge accomplishment. “This is a very important milestone for us,” he said. “We are a charity that survives on volunteer power, so I’m very proud of what we have achieved. Mr Jarrell, 60, started the charity out of his own love for cycling. He used his bike for his daily commute but, when he retired, he wanted to donate it to a worthy cause. But when he could not find anywhere to donate the bike to, he decided to set up his own charity and the operation grew from there. Mr Jarrell said his experiences of cycling were a strong motivating factor in starting the charity. He said: “I’ve been a lifelong cyclist, so I know exactly how much a bike can have an impact on someone’s life. “It’s a way for people to travel and, in a place like Sierra Leone, it can mean the difference of getting education or not. Patrick Sewell, Managing Director of Sewell on the go, said: “We were approached last year by a local charity who had a need for storage for refurbished cycles to send out to Africa. Following the new space created by the latest shipment to Sierra Leone, Mr Jarrell has appealed for more bikes to be donated. Call 07715307942 to donate a bike to the Avenues Bicycle Project.